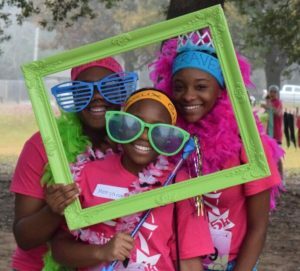 Like Junior League of Lafayette, Girls on the Run, an international positive youth development program, believes in the potential of young women. The mission of Girls on the Run is to inspire girls to be joyful, healthy and confident using a fun, experience-based curriculum that creatively integrates running. Designed for girls in middle school, Girls on the Run teaches life skills through dynamic, interactive lessons and running games. The program culminates with girls feeling physically and emotionally prepared to complete a celebratory 5K running event. Recognizing the shared vision of developing the potential of women of all ages, Junior League of Lafayette has initiated Girls on the Run programs at two local Boys and Girls Clubs and various local elementary schools. The volunteers follow the 10-week Girls on the Run curriculum, which focuses on different topics such as plugging into positivism, healthy habits and how to express feelings. The girls play different games and complete activities related to those lessons and finish by running laps to get them ready to run the 5K. Junior League of Lafayette volunteers have noticed that the girls are not only becoming stronger runners – they are also more independent and confident individuals. While the running is an important aspect of the program, these young women are being empowered, and will be better prepared to take on life’s challenges. 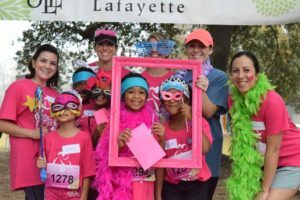 To conclude each curriculum’s session, Junior League of Lafayette teams join nearly two dozen Girls on the Run teams from throughout Lafayette for a 5K celebration run hosted by Girls on the Run of South Louisiana. Together, Junior League of Lafayette, Boys and Girls Clubs, and Girls on the Run are empowering young women one step at a time.